Inspect2GO is releasing a new software program for hotel housekeeping (http://www.inspect2go.com/hotels/housekeeping-software). The scoring and tracking program handles all functions from inspecting through reporting. Inspect2GO now offers hotel housekeeping inspection solutions tailored to the unique needs of the hospitality industry. The housekeeping inspection tool includes a mobile inspection application, cloud database and inspection management program. The system is offered as a monthly subscription service. Hotel managers and housekeeping supervisors face multiple challenges. Housekeeping inspections are time consuming. Once conducted, it is difficult to understand the inspection data in a meaningful way. Managers need comprehensive reporting to see the big picture and make use of the information. Well informed management leads to happier employees and improved guest satisfaction scores. The new Inspect2GO system is designed to solve these problems. Inspections are conducted electronically, with results going directly to the database. The inspection scoring system rates performance. A scheduler is used to assign, manage and track inspections and tasks. Work orders are sent to the maintenance or engineering department. Key performance indicators are presented with the reporting tool. Filter KPIs in the system by date, property, staff, etc. Inspect2GO ( http://www.inspect2go.com/hotels/housekeeping-software ) offers state-of-the-art inspection management software that combines mobile, cloud and database technology. Inspect offline and manage online with software designed by inspectors, for inspectors. Inspections are conducted on a native mobile app that's easy to use and functions everywhere, offline, without the need for data connectivity. iPad, Android tablet and Windows (Surface Pro) mobile applications are available. The database software enables scheduling, ad-hoc reporting, financials, permitting and management functions. 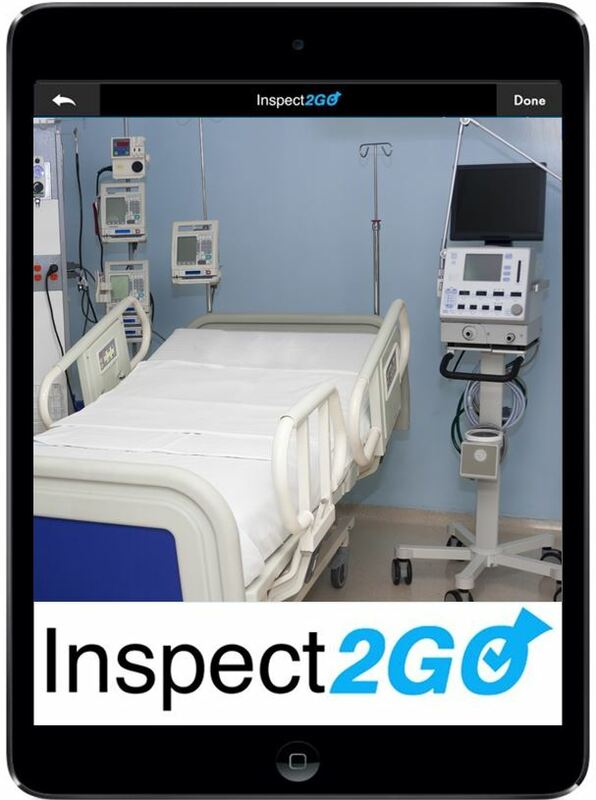 Inspect2GO's quality inspection and tracking solution (http://inspect2go.com/evs) is now offered to hospitals and medical facilities. Solutions include environmental program management, environmental services, occupational health and safety, each tailored to clients' existing checklists and processes. Inspect2GO now offers its inspection management solutions to medical facilities. Solutions include environmental program management, environmental services, occupational health and safety. The hospital’s unique QA audit forms are imported into the system for patient rooms, exam rooms, laboratories and other areas. Inspections are performed on an iPad, Android tablet or smartphone (See Video). Inspection results are sent to the hospital's in-house server or Inspect2GO's cloud database. Management runs reports on key performance indicators such as "deficiencies rank" or "inspections performed." Clients work directly with Inspect2GO to setup a tailored solution. Rooms – Inspect patient rooms, exam rooms, medical offices, etc. Reporting – By room, hospital, building, EVS tech, deficiency, date, etc. Inspect2GO, Inc., ( http://inspect2go.com/evs ) offers state-of-the-art inspection management software that combines mobile, cloud and database technology. Inspections are conducted on a mobile app. Inspection data is stored in the cloud, or on the customer's private server. The cloud-based inspection management software enables scheduling, ad-hoc reporting, data analytics, performance tracking and other management functions. The subscription based software is sold as a SAAS (software-as-a-service) product. Inspect2GO is now offering complete solutions for stormwater, wastewater, grease trap, sewer and septic system inspection. The software includes mobile inspection apps for offline field work and cloud-based office software for reporting, scheduling and record keeping. Field inspection data is entered into the system on a native mobile app, without the need for a data connection. Inspection checklists and workflows are customized to meet each agency’s specific needs. Corrective actions are noted, and re-inspection dates are automatically logged in the scheduling software. Customers work directly with Inspect2GO to tailor the system to their unique requirements. Inspect2GO, Inc., ( http://inspect2go.com/stormwater ) offers state-of-the-art inspection management and permitting software that combines mobile, cloud and database technology. Inspections are conducted on a native mobile app that's easy to use and functions anywhere, offline, without the need for data connectivity. Inspection data is stored in the cloud, or on the customer's server. The cloud-based inspection management software enables scheduling, ad-hoc reporting, data analytics, complaint management, mapping, accounting/invoicing, permitting/licensing and other management functions. The subscription based software is sold as a SAAS (software as a service) product. 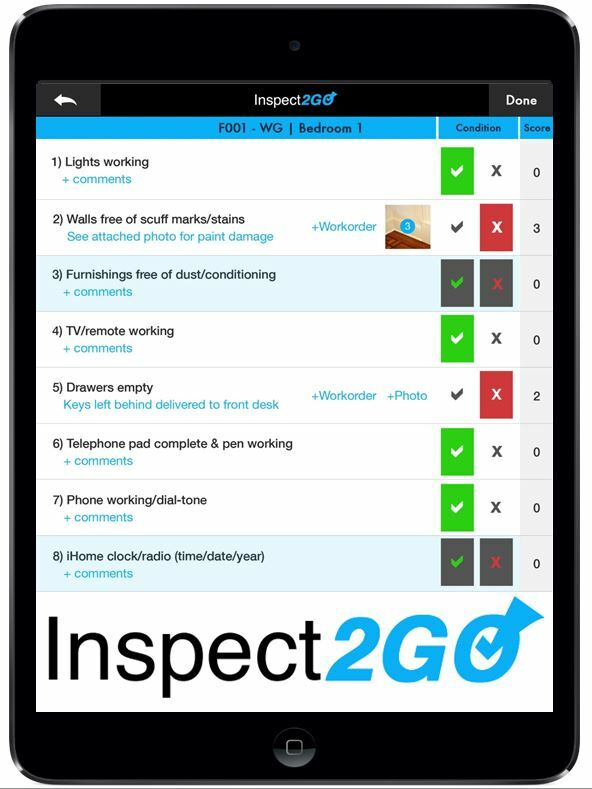 Inspect2GO launches mobile app for hotel room inspection. The application is being offered to qualified hotels on a trial basis this October. The application reduces hotel operating costs through improved communication and efficiency. Guest satisfaction scores can be improved through quality control, maintenance and tracking. The app is available for iPad, iPhone, Android or Microsoft mobile phones and tablets. Learn more at http://www.inspect2go.com/hotel/room-inspection-app. A two-week trial period is being offered to qualified hotels during October, 2016. The trial software includes some of the capabilities of the full version. Clients contact Inspect2GO directly to sign up for the trial. Inspect2GO ( http://www.inspect2go.com/hotel/room-inspection-app ) offers state-of-the-art inspection management software that combines mobile, cloud and database technology. Inspect offline and manage online with software designed by inspectors, for inspectors. Inspections are conducted on a native mobile app that's easy to use and functions everywhere, offline, without the need for data connectivity. iPad, Android tablet and Windows (Surface Pro) mobile applications are available. The database software enables scheduling, ad-hoc reporting, financials, permitting and management functions. Inspect2GO delivers the first phase of its software package to the Oklahoma City/County Environmental Health Department. This first deliverable includes cloud-based inspection software tailored the County’s EH programs (http://www.inspect2go.com/ehs). Inspect2GO, a leader in mobile inspection and cloud database solutions for government agencies, today announced its first delivery to The Oklahoma City/County Health Department. Seventeen programs have been delivered for evaluation and feedback including Complaints, Food, Hotels and Childcare. The next phase involves delivery of the offline mobile software, scheduler and reporting system. "The visionary staff in Oklahoma City/County’s Environmental Health Department is at the forefront of technology and efficiency," said Paul Smith, President of Inspect2GO. "The work done here will benefit the entire industry"
"Our health inspectors are field testing the software at this time,” said Troy Skow, Administrator for the OKC-County Health Department. “The Inspect2GO team has taken the time to thoroughly understand our needs and is configuring the software exactly as we’d like"
Inspect2GO, Inc., ( http://www.inspect2go.com/ehs ) offers state-of-the-art inspection management and permitting software that combines mobile, cloud and database technology. Inspections are conducted on a native mobile app that’s easy to use and functions anywhere, offline, without the need for data connectivity. Inspection data is stored in the cloud, or on the customer’s server. The cloud-based inspection management software enables scheduling, ad-hoc reporting, data analytics, complaint management, mapping, accounting/invoicing, permitting/licensing and other management functions. The subscription based software is sold as a SAAS (software as a service) product. Inspect2GO software has been selected by the Randolph County, Missouri, Environmental Health Department. The total solution includes an offline-capable iPad inspection app, permitting/licensing module, hosted cloud database and web-based inspection management portal. Inspect2GO, a leading provider of inspection management software, today announced a new relationship. The Randolph County, Missouri, Environmental Health Department has selected Inspect2GO’s environmental health inspection management system. The cloud-based, management software will be tailored to meet the local requirements of the health department (http://inspect2go.com/ehs/environmental-health-management-software). Inspections can be performed offline, without the need for a wireless connection. Inspectors use a native mobile app on an iPad. The establishment database, inspection history and other information are downloaded onto the iPad. This information is available to the inspector, even in rural areas with no connectivity. In additional to the inspection app, the system also includes several other modules. Licenses are issued and tracked via the permitting software. Establishments and staff are managed with web-based inspection management software. The web-based management software accesses a cloud-based inspection database. Inspect2GO’s configuration for Randolph County is similar to the version in use by Columbia/Boone County Missouri. "Inspect2GO’s iPad app is so easy to use" said Eric Breusch, Environmental Health Officer with the Randolph County Health Department. "and the web-based software lets us issue permits, schedule inspections and manage accounts electronically, just by clicking a few buttons"
"The native app lets Inspectors conduct inspections on the iPad when cell connectivity is unavailable. Health department functions are managed through cloud-based software", said Paul Smith, President of Inspect2GO. "The turnkey system is hosted and supported by Inspect2GO"
Inspect2GO, Inc., ( http://www.inspect2go.com/ehs ) offers state-of-the-art inspection management software that combines mobile, cloud and database technology. Inspections are conducted on a native mobile app that’s easy to use and functions anywhere, offline, without the need for data connectivity. Inspection data is stored on a hosted Microsoft SQL server database. Web-based inspection management software enables scheduling, ad-hoc reporting, data analytics, complaint management, mapping, accounting/invoicing, permitting/licensing and other management functions. Inspect2GO requires no up-front setup fee, even for custom configurations. The SAAS (Software-As-A-Service) product is provided on a subscription basis. Inspect2GO software has been selected by the Princeton, NJ, Health Department (http://www.inspect2go.com/ehs). The total solution includes a mobile inspection application for iPad, permitting/licensing module, cloud database and web-based management system. Inspect2GO, a leader in cloud-based inspection and permitting systems, today announced a new relationship. 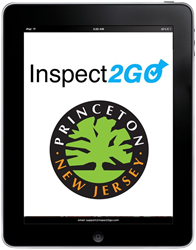 The Princeton, NJ, Health Department has selected Inspect2GO’s Inspection Management Software. The cloud-based, inspection and permitting system will be tailored to meet the local requirements of the environmental health department. The system includes several modules. Inspections can be performed using a web-based mobile app. Licenses are issued and tracked via the permitting software. Establishments and staff are managed with web-based inspection management software. The web-based management software accesses a cloud-based inspection database. 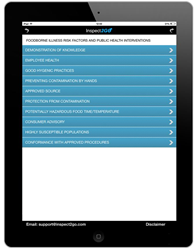 Inspect2GO’s configuration for Princeton is specifically designed for health inspectors using the iPad (http://www.inspect2go.com/ehs). "We chose Inspect2GO because the system is so easy to use" said Jeff Grosser, Health Officer with the Princeton Health department. "Inspections, data handling, scheduling and permitting are handled from a single, cloud-based solution. We will also be able to quickly identify statistical trends through the Inspect2GO dashboard." "Princeton is our first municipal client in New Jersey," said Paul Smith, President of Inspect2GO. "The new system streamlines several processes under one software umbrella to improve efficiency and quality"
Inspect2GO ( http://www.inspect2go.com ) offers state-of-the-art inspection management software that combines mobile, cloud and database technology. Inspect offline and manage online with software designed by inspectors, for inspectors. Inspections are conducted on a native mobile app that’s easy to use and functions everywhere, offline, without the need for data connectivity. iPad, Android tablet and Windows (Surface Pro) mobile applications are available. The Microsoft SQL database software enables scheduling, ad-hoc reporting, financial, permitting and management function. Inspect2GO's offline-capable inspection app and web-based inspection management software has been chosen by the Berrien County Health Department. The system runs entirely on Microsoft technology, using a Surface Pro 4 inspection application and Microsoft SQL Server Database. (http://www.inspect2go.com/ehs). Inspect2GO (http://www.inspect2go.com/ehs), a leader in mobile inspection and cloud database solutions for government agencies, today announced a new relationship. 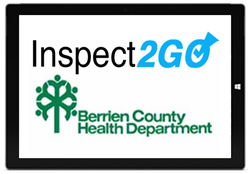 The Berrien County Health Department has selected Inspect2GO's Inspection Management Software. The total solution software is designed for Environmental Health Departments and other government agencies that conduct inspections and audits using Surface Pro, iPad and other mobile tablets. Inspections can be performed without a connection, offline, using the native mobile app. Inspect2GO’s configuration for Berrien County is specifically designed for the Microsoft Surface Pro 4 tablet running MS Windows. Inspection management, scheduling, permitting/licensing and payment tracking are managed through a web-based portal. Historical information is stored on a Microsoft SQL Server Database. The entire system is based on Microsoft technology. Mike Mortimore, Health Officer at the Berrien County Health Department said, "Inspect2GO's custom configuration will help streamline inspections for our Environmental Health staff so that we can be more effective and efficient in our work of protecting the public's health." Berrien County's configuration includes the Michigan Food Establishment Inspection Report (FDA 2009 food code equivalent), Michigan Food Establishment Evaluation Report (FDA 2009 food code equivalent), Temperature Recording Tables, Water Supply, Sewage, Campground and Swimming Pool modules. Functions include the field inspection application for Microsoft Windows Surface Pro 4, web-based inspection management portal, Microsoft SQL database, scheduling, permitting/licensing, reporting and fee tracking. "Berrien County's system utilizes a range of Inspect2GO capabilities," said Paul Smith, President of Inspect2GO. "Several Environmental Health functions are included in one complete solution." Inspect2GO, Inc., ( http://www.inspect2go.com/ehs ) offers state-of-the-art inspection management software that combines mobile, cloud and database technology. Inspections are conducted on a native mobile app that’s easy to use and functions anywhere, offline, without the need for data connectivity. Inspection data is stored on a hosted Microsoft SQL server database. Web-based inspection management software enables scheduling, ad-hoc reporting, data analytics, complaint management, mapping, accounting/invoicing, permitting/licensing and other management functions. 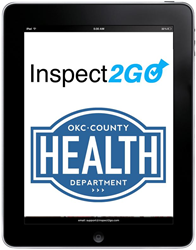 Inspect2GO's iPad inspection and cloud management software has been chosen by the Oklahoma City/County Environmental Health Department. The paperless solution improves efficiency for field inspectors and management (http://www.inspect2go.com/ehs). Inspect2GO (http://www.inspect2go.com/ehs), a leader in mobile inspection and cloud database solutions for government agencies, today announced a new relationship. The Oklahoma City/County Health Department has selected Inspect2GO's Inspection Management Software. The total solution software is designed for Environmental Health Departments and other government agencies that conduct inspections and audits using mobile devices. 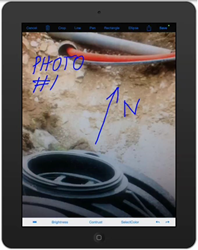 Inspections can be performed without a connection, offline, using the native mobile iPad app. Inspections, schedules and permits are managed through a web-based portal. Historical information is stored on a hosted database. The full environmental health software suite encompasses key management functions for public health departments, restaurants and the related industries. "We are fortunate to work with Oklahoma City's environmental health team," said Paul Smith, President of Inspect2GO. "They have a clear understanding of their needs and our software is a solid fit." "The Inspect2GO/iPad combo will give our inspectors the mobility and ease of use they need in the field," said Troy Skow, Administrator for the OKC-County Health Department. "The system's database and reporting functions will streamline our process and improve efficiency." Inspect2GO, Inc., (http://www.inspect2go.com/ehs) offers state-of-the-art inspection management software that combines mobile, cloud and database technology. Inspections are conducted on a native mobile app that’s easy to use and functions anywhere, offline, without the need for data connectivity. Inspection data is stored on a hosted Microsoft SQL database. Web-based management software enables scheduling, ad-hoc reporting, data analytics, accounting, permitting and management functions. New mobile/cloud data collection software (http://www.inspect2go.com/data-collection) empowers field inspectors working in remote locations. The system incorporates an offline capable tablet app, cloud database, data analytics and ad hoc reporting. Inspect2GO releases new software designed for outdoor data collection. The system is capable of operating in remote locations without wireless connectivity. Field data is collected via a native mobile app for iPad, iPhone, Android tablets and Windows mobile devices. Take photos, gather evidence, document inspections, reference regulatory codes and view historical data while in the field. When connectivity is available, the app syncs with a cloud database. Ad hoc reporting and data analytics are also cloud based. Options include permitting, licensing, scheduling, geolocation, data security and notifications. A custom dashboard is tailored to each client’s needs. The app/cloud combination combines the remote capability of a native mobile app with the database and reporting power of the cloud (see http://www.inspect2go.com/data-collection). The system is designed with many potential applications in mind. Possibilities include construction, civil engineering (structural assessment), property (multi-unit housing), environmental compliance monitoring (water, pollutant, air and hazardous materials), site inspection and other data collection processes conducted in the field. Inspect2GO ( http://www.inspect2go.com ) offers state-of-the-art inspection management software that improves quality and reduces costs. The software combines mobile, cloud and database technology. Inspections are conducted on a native mobile app that’s easy to use and functions anywhere, offline, without the need for data connectivity. iPad, Android tablet and Windows mobile applications are available. The app syncs with a Microsoft SQL database for data storage. Software functions include inspection, scheduling, permitting, work orders, accounting, data analytics, ad-hoc reporting and management. Solutions are customized to fit the specific needs of each client. New cloud and mobile technology from Inspect2Go (http://www.inspect2go.com/qc) improves quality for small manufacturing companies. Quality checks and test results are entered on a tablet and stored on the cloud for real reporting and notifications. Manufacturers lower costs and improve product quality using mobile and cloud based quality management software. Quality checks, defects and test results are logged on an iPad, Windows tablet or Android device, on the production floor. Inspection data is stored in the cloud or on the manufacturer’s internal server. Real-time notifications preempt immediate production quality issues. Ad hoc reporting, statistical analytics and data visualization are used to spot long term trends and process improvement opportunities. Quality control and quality management solutions are customized to each manufacturer’s specific requirements. 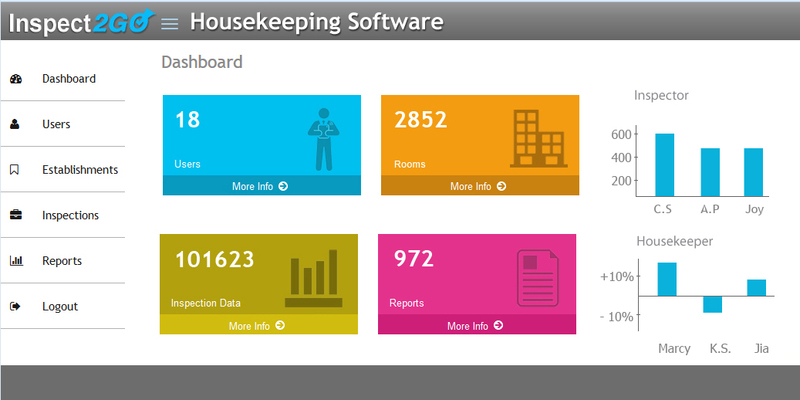 Inspect2GO adds graphical reporting capabilities to its Hotel Housekeeping Software (see http://www.inspect2go.com/hospitality). One software package is used to inspect rooms on iPads, generate work orders and display key performance indicators. 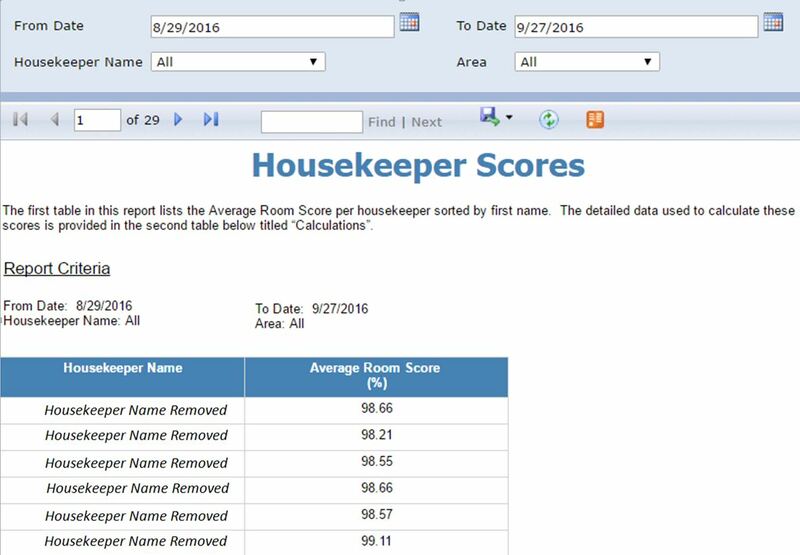 Housekeeping Directors and Maintenance Managers need to quickly visualize staff performance. Inspect2go now offers data graphing and charting capabilities for its hotel room inspection software. Inspections are conducted using an iPad. Quality data is stored and key performance indicators are graphed for easy viewing. The Inspect2go system is optimized for large hotels with full time hotel room inspectors. Mobile App - Inspections are “offline capable” using a native mobile iPad app. Inspections are not interrupted by wifi connectivity issues. Cloud-based management software. Compatible with PC’s and mobile devices. The environmental health software combines web, mobile and database technology. Offline inspection, web-based reporting and data management modules are customized for public health departments, restaurants and industry (http://www.inspect2go.com/ehs/environmental-health-management-software ). Inspect2GO advances its environmental health management software with new tools. A custom dashboard provides key information at a glance, tailored to the unique needs of each inspector and supervisor. Inspections, schedules, fees and permits are managed through a web-based portal. Inspections can be performed without a connection, offline, using native mobile apps on iPad, Surface Pro or Android tablets. The full environmental health software suite encompasses key management functions for public health departments, restaurants and industry. For demonstrations contact Inspect2go (http://www.inspect2go.com/ehs/environmental-health-management-software). Inspect2GO ( http://www.inspect2go.com/ehs ) offers state-of-the-art inspection management software that combines mobile, cloud and database technology. Inspect offline and manage online with software designed by inspectors, for inspectors. Inspections are conducted on a native mobile app thats easy to use and functions everywhere, offline, without the need for data connectivity. iPad, Android tablet and Windows (Surface Pro) mobile applications are available. The Microsoft SQL database software enables scheduling, ad-hoc reporting, financial, permitting and management function. Inspect2GO's new software includes ad-hoc reporting, monitoring and corrective action tracking. A web-based dashboard displays management functions and inspection data (see http://www.inspect2go.com/reporting). Inspect2GO has released a new software customization service to meet the needs of corporate and government clients (http://www.inspect2go.com/reporting). User interfaces, workflow, database configuration and reports are each customized by Inspect2GO as the system is setup. Clients receive a complete solution that is tailored their unique requirements within 6 months. Field inspections are conducted on an iPad, Android or Microsoft tablet. Private data is encrypted, secure, and can be stored exclusively on the customer’s server. Uses include internal self-audits, quality assurance and regulatory compliance inspections. The inspection management and reporting functions are web-based. Search and sort by violation, location, history, date, audit, inspectors, etc. New drawing and dimensioning software from Inspect2GO has many applications. 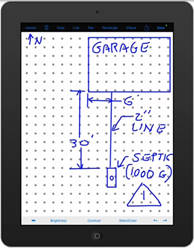 Draw lines, geometrical shapes and dimensions while performing inspections on an iPad. Inspectors often need to make quick sketches, markups or hand-written notes while in the field. The new drawing and dimensioning program from Inspect2GO incorporates this functionality into its existing inspection software. Inspect2GO ( http://www.inspect2go.com ) offers state-of-the-art inspection management software that combines mobile, cloud and database technology. The software was designed “by inspectors, for inspectors”. Inspections are conducted on a native mobile app that’s easy to use and functions offline without the need for data connectivity. iPad, Android tablet and Windows (Surface Pro) mobile applications are available. The Microsoft SQL database software enables scheduling, ad-hoc reporting, permitting and management functions. Environmental health departments face challenges inspecting water well and septic systems. 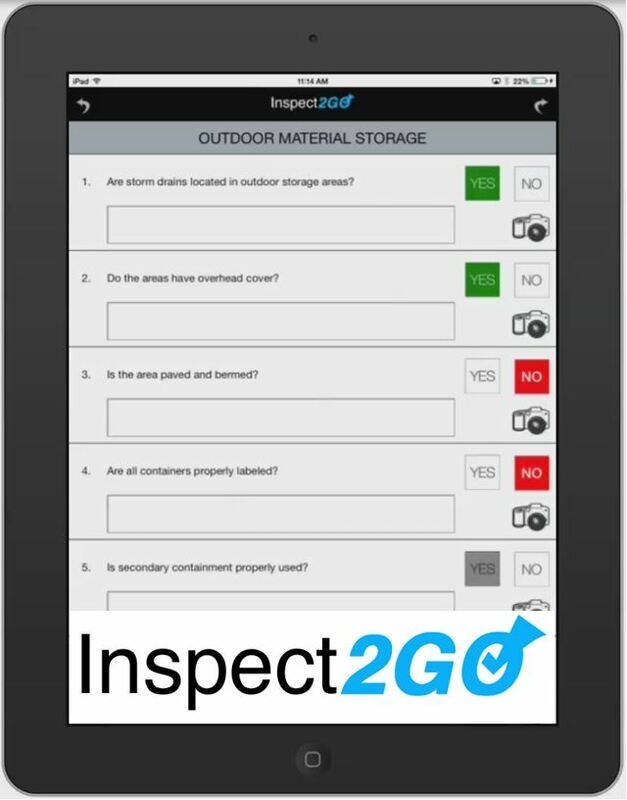 Inspect2GO's all-electronic version enables site plan sketching, photo taking and other well/septic inspection functions. 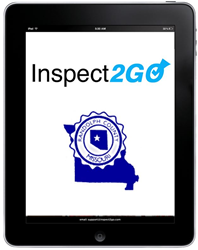 Inspect2GO (http://www.inspect2go.com) has released new tablet-based software to facilitate water well and septic system inspection. The software functions on iPad, Android or Windows tablets. Inspectors can draw a site plan electronically to show septic tanks, pipes, drains, wells and structures. Dimensions and geometric shapes can be drawn as well. Inspect2GO ( http://www.inspect2go.com ) offers state-of-the-art inspection management software that combines mobile, cloud and database technology. The software was designed "by inspectors, for inspectors". Inspections are conducted on a native mobile app that's easy to use and functions offline without the need for data connectivity. iPad, Android tablet and Windows (Surface Pro) mobile applications are available. The Microsoft SQL database software enables scheduling, ad-hoc reporting, permitting and management functions. 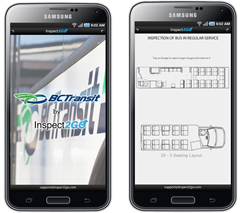 British Columbia's BC Transit has selected Inspect2GO's vehicle inspection software. The tablet-based mobile app will be customized to BC Transit's bus inspection process. BC Transit coordinates the delivery of public transportation within British Columbia, Canada, outside of Greater Vancouver. The Inspect2GO (http://www.inspect2go.com/inspection/vehicle) application is being tailored to BC Transit's specific process. Inspectors follow an electronic inspection checklist. Photos, signatures and notes are saved with each inspection. "Inspect2GO is able to customize its vehicle inspection software to meet our exact needs," said Alan Stewart, Fleet Inspector/Trainer with BC Transit. "Our advanced‎ mobile process has been simplified with intuitive user interface screens that our inspectors can quickly understand." The Clark County Health Department deploys new mobile technology. The Inspect2Go (http://www.inspect2go.com/ehs) application is tailored to the county’s specific needs. Inspect2GO has delivered its Environmental Health Inspection Software to Clark County, Illinois. The software is customized to meet the county's unique requirements. Food establishments are inspected according to local food codes. A data connection is unnecessary while using the iPad inspection app. Basic information on each food establishment in the county is available on the iPad database. "The Clark County Health Department chose Inspect2Go for its innovative tablet design and unique customization properties that fit our exact needs and assisted in our goal of becoming a completely paperless department," said Cody Vaughn, Director of Environmental Health for Clark County. 2019 © Inspect2GO All Rights Reserved.